Oy! From 46 degrees to 86 back to 16 and now 56.... my word, make up your mind planet. Luckily with the sun, it's just warm enough to go for a nice walk without the coat. I think it's time for a 7-11 run. "Get ready to make your mouth race. Each delicious drop of Mountain Berry Blast is enough to pack your taste buds with get-up-and-go. We're talking downhill, double black diamond non-stop flavor so powerful you can skip the ski lift and just powerwalk up the mountain with Snow Patrol on your back." Oh, and that * next to Blast, well, there's a disclaimer with this Slurpee : "this is not a sports drink"
Now let me translate the 7-11 lingo into something you can understand. "Get ready to make your wallet race back to the store and demand your $1.81 back. Each disgusting drop of Mountain Berry Blast is enough to make your taste buds pack up and leave. We're talking disgusting, double fake non-stop flavor torture so overpowering you can do a spit take on every slurp. If you get the snow patrol to try this, they will bar you from the ski lift and make you walk up the mountain by yourself." 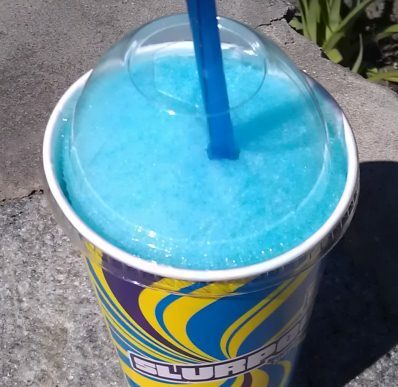 This Slurpee is like a cross between artificial blue raspberry flavor and some kind of cheap lime-ade. I wanted to spit it out the second it hit my tongue. Being a trooper, I did press on and actually managed to consume about 10oz or so of this potent disaster. As you keep going, you try to convince yourself that "maybe it's not that bad" and "maybe I can get through this tangy blue raspberry mess", but as soon as you stop for say two minutes, the whole "I want to spit this out" reflex comes back. This flavor is twice as strong as it needs to be. I'm just glad I'm done with it and hopefully I can save a few of you from suffering through it. Haha Dubs I loved your take on the slurpee - sorry it sucked but you gave me a good laugh! This one is actually my favorite slurpee they have. I usually mix Slurpee flavors, esp the kind of weird "berry" ones with cola or something, so it's just right.